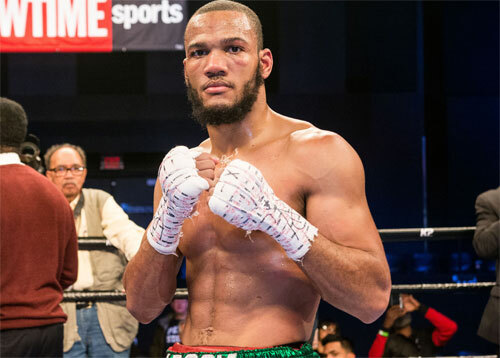 In the scheduled 12-round main event at the Sands Event Center in Bethlehem, PA, West Philly's Julian Williams put himself in line for a crack at the IBF world junior middleweight title by defeating Marcello Matano of Italy in their 154-pound title elimination bout with a seventh round TKO. Matano, 16-2, 5 KOs, was tenacious and tough, but Williams, 23-0-1, 14 KOs, 1 No Contest, kept his cool and boxed smartly and carefully and stayed in control all night. Williams started cautiously, but built momentum by consistently landing shots on the peppy, forward-moving Italian. Williams piled up rounds and never slipped behind on punch count statistics or the official scores. Slowly but surely, the Philadelphian broke down his opponent with well-placed shots and a steady body attack. J-Rock banked all of the first six rounds on the official cards, while I gave round four to Matano. However, it was clear from the very start that Williams was on his way to winning this one. 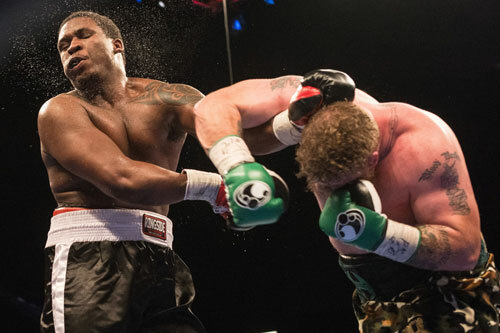 Finally in round seven, Williams staggered Matano with a left hook and immediately blasted him with a hard right hand. 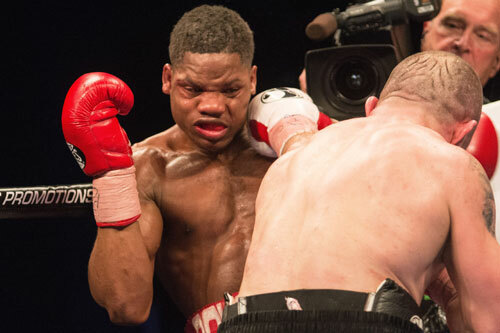 Matano wobbled and Williams knew he suddenly had the fight within reach. Julian unloaded with an extended combination, hitting Matano with everything he threw, and referee Gary Rosato had no choice but to stop the fight. The time was 2:24 of round seven. 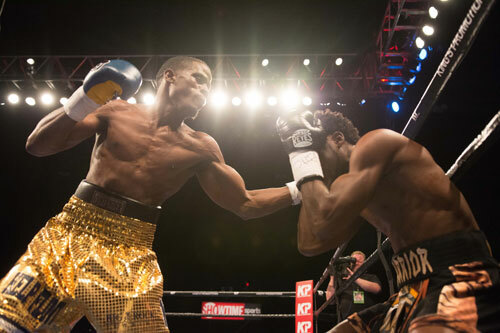 After the fight, Williams called for IBF champ Jermall Charlo to give him a shot at his title. Williams' career has been steadily rising over the past few years. It appeared that he might land a title shot last year, but Williams could not corner one of the champions. After his win over Matano, it finally seems that it is now only a matter of time before he gets his chance. Charlo is a skilled and classy young champ, but Williams is ready and able to beat him. At the very least, he deserves the opportunity. So, 2016 should be J-Rock's year. 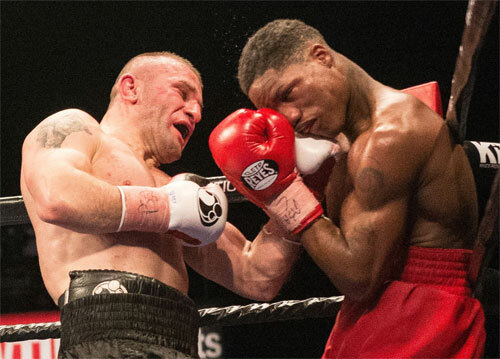 Veteran middleweight Avtandil Khurtsidze, 32-2-2, 21 KOs, surprised previously unbeaten, star prospect, Antoine Douglas, 19-1-1, 13 KOs, scoring a tenth round TKO in their WBO International title bout. Khurtsidze jumped on Douglas at the opening bell and kept up the pressure for the next 30 minutes or so. Khurtsidze's attack was brutal and relentless, and served as a pop quiz for the star student Douglas. In round three Khurtsidze dropped Douglas with a left hook. Antoine slumped over the ropes and nearly fell out of the ring. Many young unbeaten fighters would have folded under the pressure. No one would have blamed him, if Douglas ended his night right then and there. 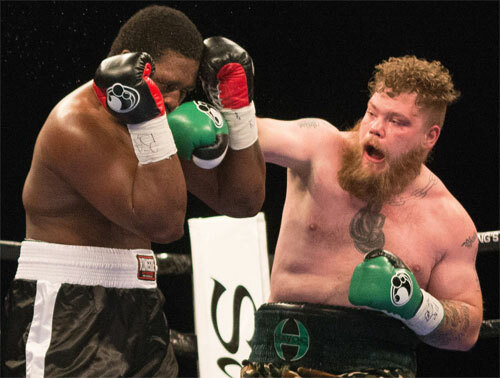 However, Douglas rose from the knockdown and endured the beating. When he action resumed, the Brooklyn-based Georgian continued the beating, pounding away, but he could not finish his foe. Miraculously, Douglas mounted a comeback beginning in round four. Then over the next few rounds, the Washington, DC fighter closed the gap. Douglas won the fourth, fifth and sixth on my card, and erased all of the scorecard deficit except for the knockdown. Antoine's comeback and durability under fire, put on display tons of heart and an amazing resiliency that none of us ever knew he had. However, Khurtsidze was not going away. 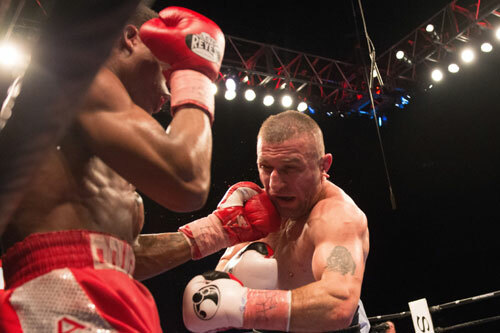 Early in round seven, Khurtsidze walked out and floored Douglas with a booming left hook. Antoine crashed to the canvas and suddenly Khurtsidze was back in control of the thrilling fight. After the knockdown, Khurtsidze never took his foot off the gas pedal. He bludgeoned his opponent on the inside and against the ropes, but Douglas was landing too as the fight just kept getting better. This was a spectacular battle filled with drama. Douglas showed gritty determination, but this was Khurtsidze's night. With the final round approaching, and with a comfortable lead on the cards, Khurtsidze closed the show. He refused to let Douglas back into the fight and kept chopping away, still working for the knockout. Finally in the tenth round, Khurtsidze landed a vicious flurry that staggered Douglas. Suddenly he strength was sapped and he sagged against the ropes. 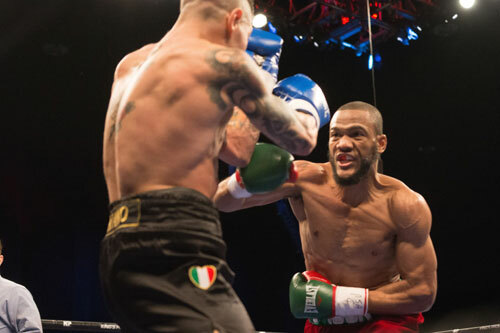 Antoine had put up a terrific fight, but at that moment, with more than two minutes remaining in the round, referee Benji Esteves felt forced to stop the fight. The time was 33 seconds of the tenth and final round. 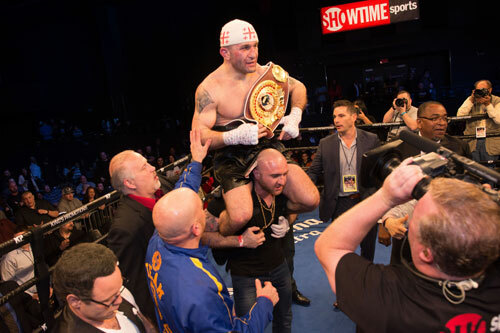 "I showed the world what I can do," Khurtsidze, 35, said after the fight. "I'm crushed," Douglas said about his first pro defeat. This was clearly the best fight of the evening, and none of us who were watching would be surprised if Khurtsidze-Douglas was still in the conversation for "Fight of the Year" honors at the end of 2016. 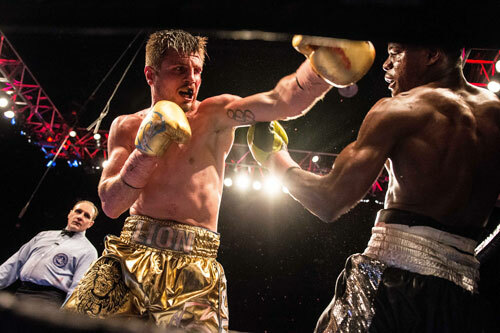 In the first televised fight of the night, Detroit middleweight Tony Harrison, 23-1, 19 KOs, looked sharp and accurate stopping Fernando Guerrero, 28-4, 20 KOs, of Salisbury, MD, in the sixth round of their scheduled ten rounder. Harrison scored one knockdown in the second round and two more in the sixth. 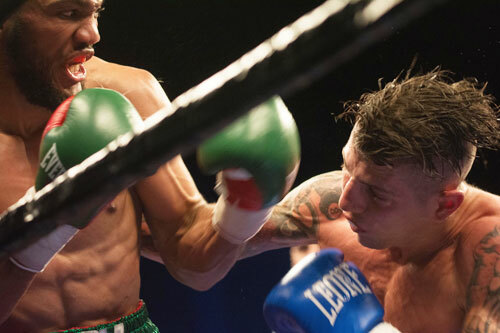 However, Guerrero was game throughout the fight, firing back when pressed, despite being out-gunned all night. After the second knockdown in round six, referee Gary Rosato smartly stopped the contest. The time was 1:54. 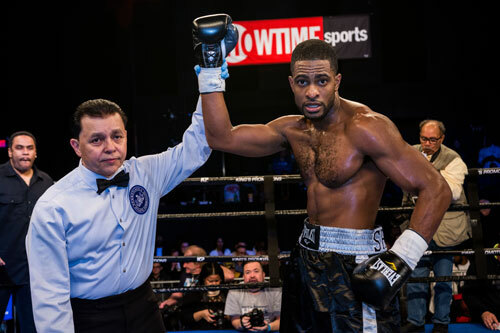 In a quick light heavyweight Amir Shabazz, Philadelphia, 3-0, 1 KO, scored his first career stoppage over Atlanta's Hakeem Atkinson, 2-2, 1 KO, in the first round of their scheduled four rounder. Shabazz put Atkinson down twice, first with a left hook and then with a right. Atkinson made it to his feet both times, but referee Benji Esteves stopped the fight at 2:01, with Hakeem in no condition to continue. 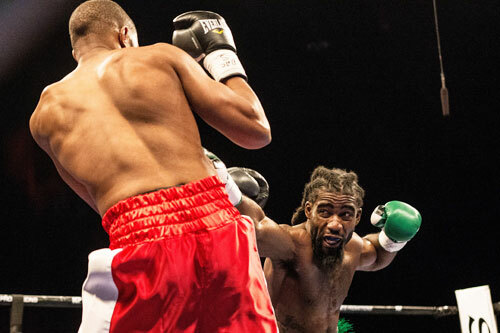 In another quickie, super middleweight bout, Philly's Anthony Miller, 3-1, 3 KOs, dropped Harrisburg's Terrence Williams, 4-1, 1 KO, late in the first round. Williams survived the attack and made it to the bell, but did not come out for round two. The results went into the books as a first round TKO at 3:00 for Miller. Philly heavyweight Joey Dawejko, 17-4-2, 9 KOs, stormed out at the opening bell to try to add another quick knockout to his record. He cracked Ytalo Perea, 6-2-2, 4 KOs, with his first blow, a looping right hand, but the Ecuador native withstood the blow, and everything else Joey threw at him. Dawejko kept up the pressure and continued to swing for the fences, but Perea was durable. After a few rounds, Dawejko started to lose steam. Although Joey was tiring, he was still winning rounds. I gave him the first five, but by round six, Dawejko was out of gas. As Joey sagged, Perea surged through that suddenly open door. Perea took the last three rounds to close the gap on my card. However, by the end of eight, Dawejko was still in the lead on my score, five rounds to three (77-75). The three official judges had three different opinions. Judge Waleska Roldan favored Dawejko, 78-74. Mike Somma had Perea ahead, 77-75. Finally Tom Schreck scored it even, 76-76, for a split decision draw. 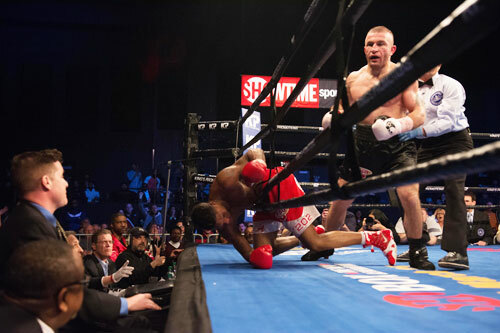 Middleweight Ievgen Khytrov, 13-0, 11 KOs, defended his NABF title belt with bruising and bloody ten round unanimous decision over tough Kenneth McNeil, 9-2, 6 KOs. The Brooklyn-based fighter suffered a cut left eye in round three that bled for the remainder of the fight. 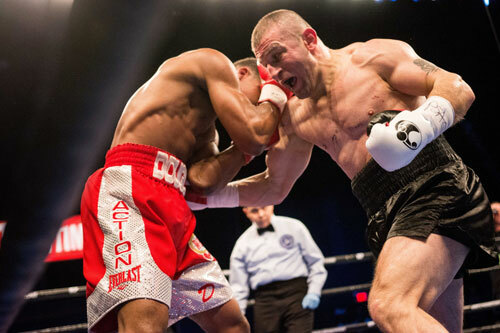 However, Khytrov managed to keep the lead over McNeil, Birmingham, AL, throughout the ten rounds. The action was fierce with both fighters landing often. Khytrov dropped McNeil with a left hook in the final round and went on to claim the official decision by scores of 99-90 and 97-92 twice. 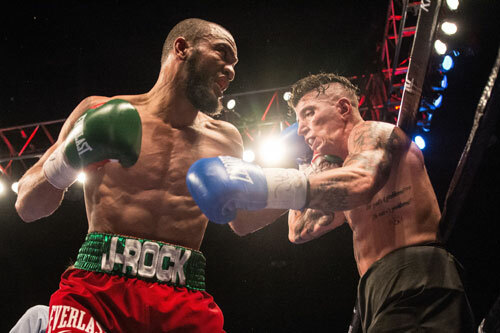 In the first fight at the Sands Event Center in Bethlehem, PA, junior middleweight Chordale Booker, Brooklyn, NY, made a successful pro debut with a second round TKO of fellow southpaw Antonio Allen, 0-1, of Philadelphia. Booker won the first round before battering Allen along the ropes in round two. Allen stayed on his feet, but referee Eric Dali halted the fight to save him from further punishment. The time was 1:56. The eight bout card was promoted by Marshall Kauffman's Kings Boxing. The Williams-Matano, Khurtsidze-Douglas and Harrison-Guerrero fights were televised live by Showtime.